Steven Litt has written a short piece for the Plain Dealer (Cleveland, OH) ("N.Y. dealer being probed may have sold to art museum ", June 4, 2010). He notes that the Cleveland Museum of Art "declined to comment" on the story, even though the pieces had been part of the batch of antiquities returned to Italy. Litt was asking a reasonable question: what else was obtained by Almagià? "We have not been contacted by the Italians, nor have we seen documents referenced in the article," Christa Skiles, assistant director of communications at the museum, said Thursday in an e-mail. "Right now, there are too many questions for us, and likely all of the other museums included in the story, regarding this investigation." Cleveland Museum of Art has been reluctant to release the collecting histories ("provenance") of the pieces returned to Italy. (Boston's MFA and the J. Paul Getty Museum have released the information in full.) However it is suggested that some of the items passed through the hands of Giacomo Medici, Robert Hecht, Fritz Bürki and Robin Symes. Is this the case? The staff at Cleveland should release information about any other objects in the collection linked to Almagià. They seem to be unaware of the need for transparency under the AAMD's guidelines. 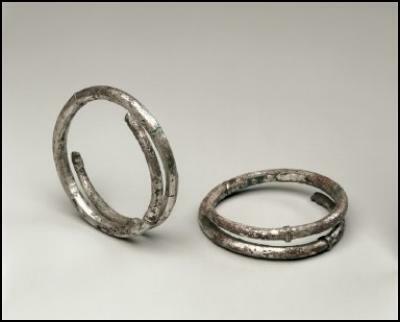 Two Etruscan silver bracelets returned to Italy from the Cleveland Museum of Art [archived here].